... and WAY too many more to show here! Seems like sewing has taken a back seat to embroidery the past few weeks, as I've grown more comfortable with the medium and more excited to introduce it to more of my projects. I thought I'd post an update on some of the stitching that's been going on around here. 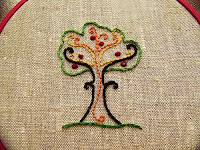 First, I participated in the inaugural "Hand Stitched" Embroidery Swap over on Flickr. 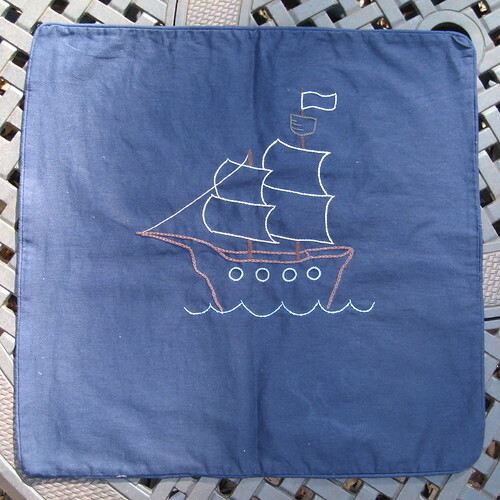 For this swap, we were assigned secret partners and asked to embroider something for them that was based on their preferences & style, and suitable for hanging in an embroidery hoop. I was lucky enough to pull Paloma (aka Three Kitchen Fairies) as my swap partner. Paloma stated that she loves birds, cupcakes and, among other things, black & white polka dots. 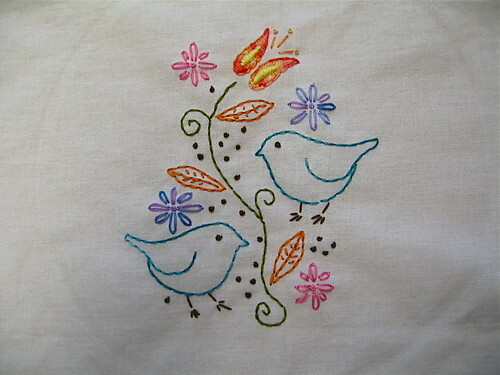 Well, do you remember the little birds I stitched a few weeks back based upon some prints from Etsy seller beethings? Turns out there was a third design in that series, featuring a bird atop a happy smiling cupcake. Perfect! 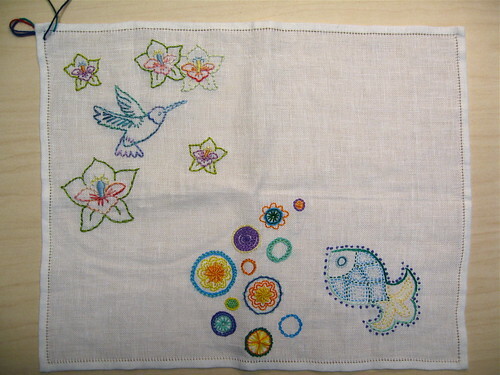 On the receiving end of this swap, I received this wonderful little design from Amanda (amandahall25). Fall is, by far, my favorite season of the year, and I tend to gravitate towards autumnal colors, so this was PERFECT for me. It's already hanging in our kitchen! 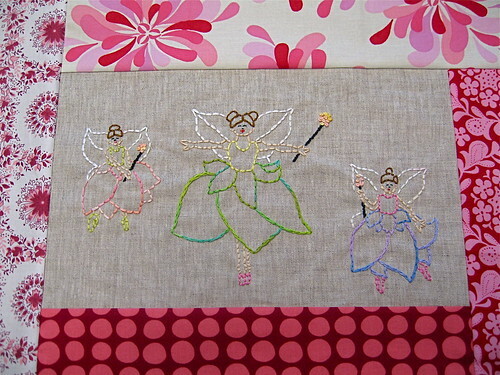 It's based on a pattern from one of my favorite embroidery designers, Corinne of SeptemberHouse. 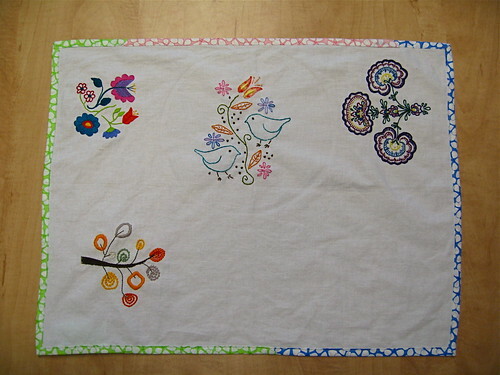 As I've mentioned before, I've also been taking part in the Tea Towel Tour, hosted over on Craftster. 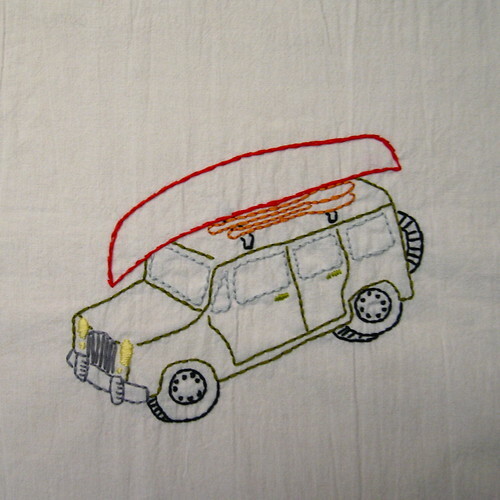 Being part of this group has been so great, because it's like I took a crash course in embroidery! It helped me to learn new stitches & techniques, find great new resources for patterns, and overall just be inspired by the awesome talents of all of the group members. 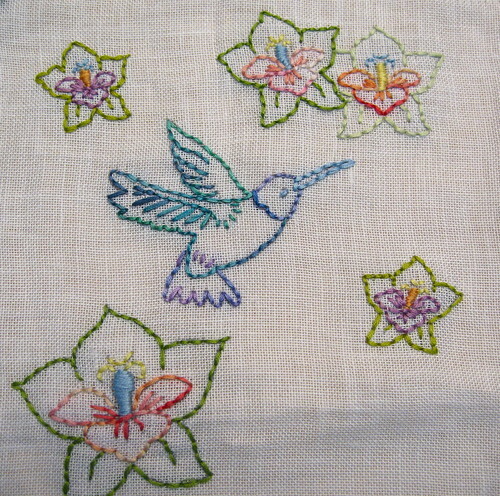 First, some lotus flower and hummingbird patterns frommy Sublime Stitching books for Kitten Wrangler, who was looking for designs based on Indonesian designs and motifs. Isn't it the best? As soon as I can pick up a pillow form for this cover, it will live on my 3 year-old son's bed. I love my crafty friends! 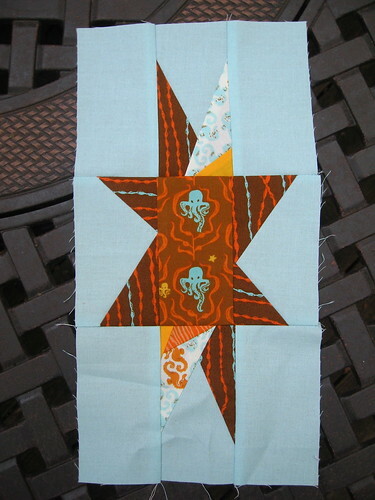 I've been on a bit of a quilt block tear lately, so it'll be back to sewing for my next post! ... especially when they continue to deliver such great & inspirational content. 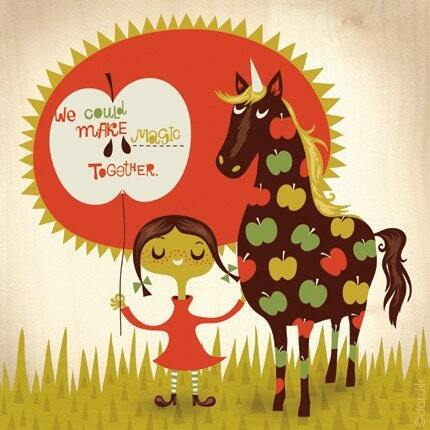 Lizzy House revealed the prints from her latest line, Castle Peeps, which is sure to become a quick favorite of mine. Saw this awesome Craftzine tutorial for a twist on the old t-shirt quilt: the T-Shirt Memory Scarf. 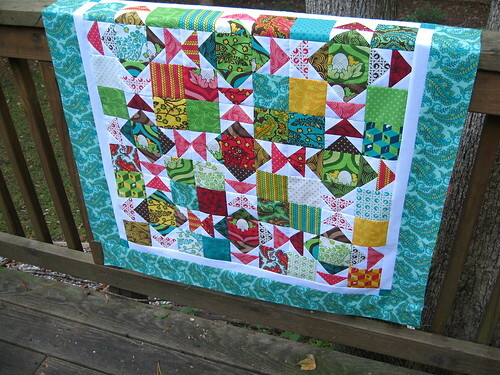 Seems like a more manageable project than a whole quilt, while achieving the same effect. 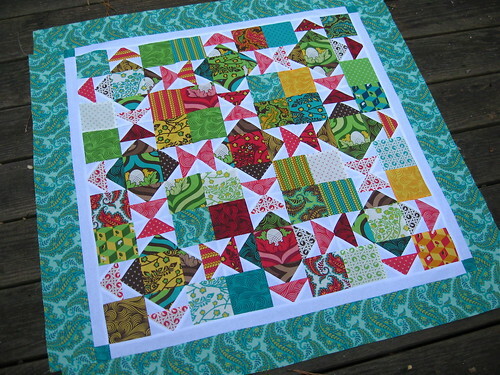 I'm already envisioning a version with some of my favorite quilting fabrics in the mix. Jessica Jones over at How About Orange always posts the coolest things. A recent find: the NaniBird. 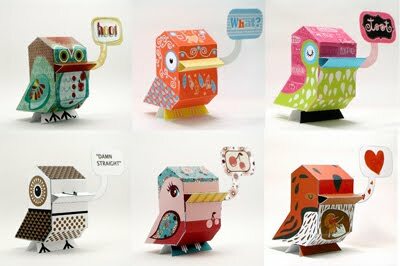 I'd love to have some of these guys both in my cubicle and in my sewing space. Pretty neat, no? I feel it's important to take a step back and say a big THANK YOU to all of the bloggers out there for continuing to share your crafts, your inspiration, and your encouragement for creative souls like me. Have you found anything cool or inspirational lately? Please share! 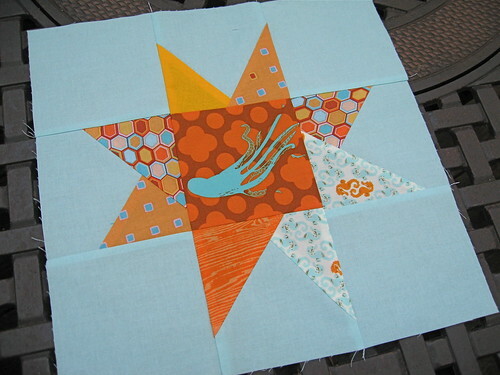 In the SewConnected 3 group, Ashley sent out the always fabulous Mendocino fabrics with a pale blue solid and asked for wonky star blocks in a variety of sizes. 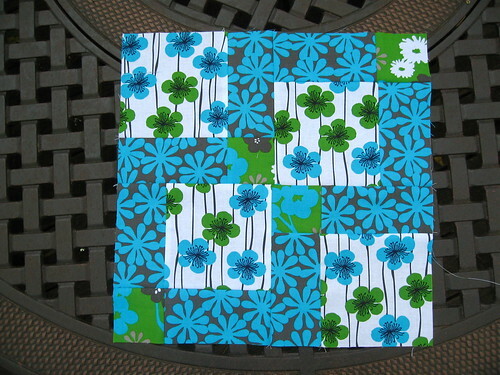 I was able to make three blocks from Ashley's fabrics. I had fun with this next one, which finished out at 6.5" wide by 12.5" tall. Every time I look at it, I think that my photo is stretched ... but it's not! I was experimenting a bit and added some "shards" into the points. See them on the top right and bottom left points in the star above? 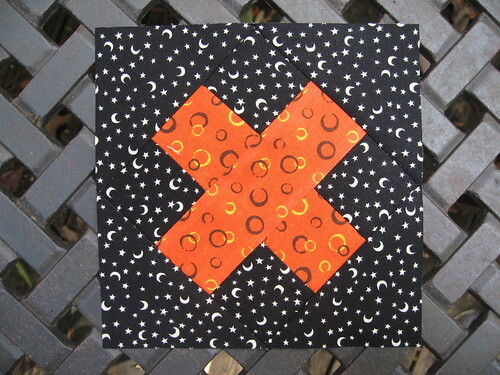 For some reason, I just love making those little "X" blocks. 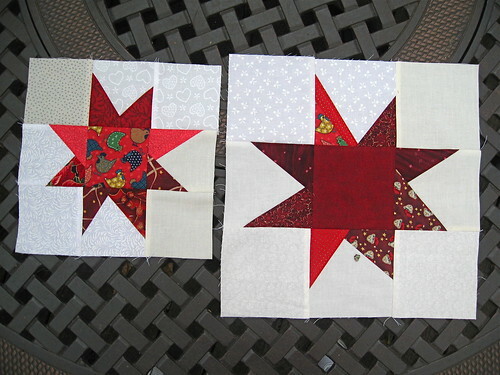 I think they're a great addition to any quilt design. 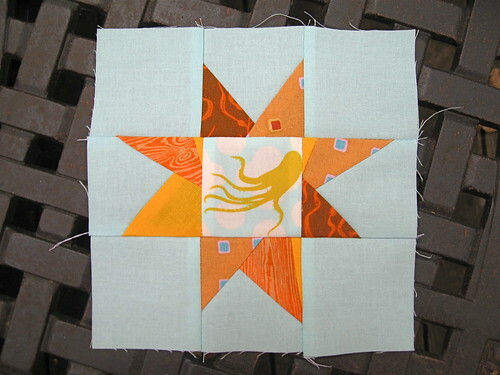 For my next block, I decided to play a bit with curved piecing. I wanted to go with a more wonky look, rather than precise ... so my disclaimer for the next photo is that the pieces were never intended to match up!! 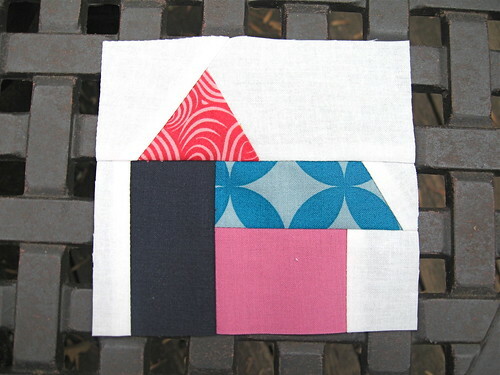 Next up are Karla's blocks for the bee inspired group. 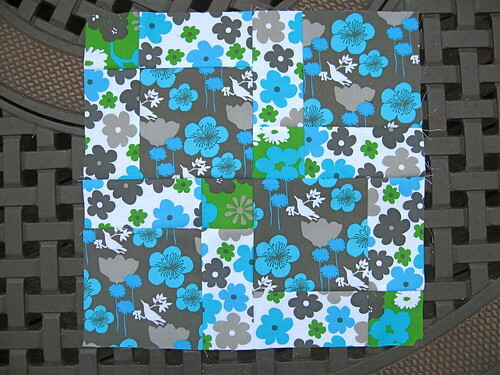 She sent a selection of fabrics from the Botanical Pop line and requested disappearing 9-patch blocks. A simple pattern, but always fun to make. 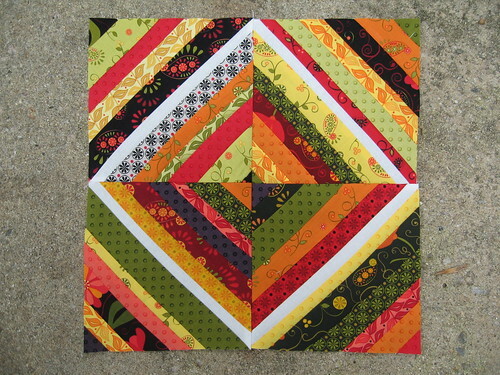 I was able to eke out two blocks from Karla's fabric. And finally, September was Amanda Jean's month in the original SewConnected group (which *sniff* is nearing its final month). 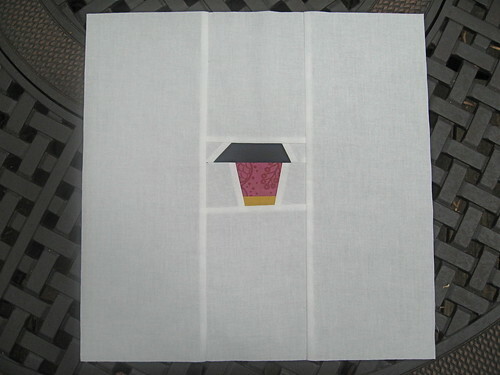 She requested 15.5" blocks featuring tiny houses sitting in a field of creamy white, inspired by this awesome, amazing, super cool Ingrid Press quilt. 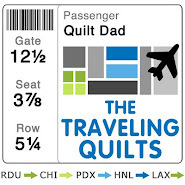 So there it is, folks -- another month in the books for virtual quilting bees. 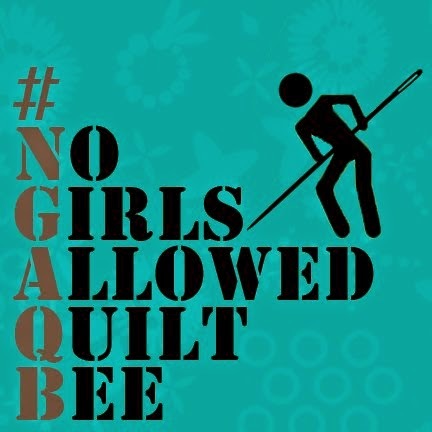 And if you've been itching to get involved in a virtual quilting bee like the ones shown here, I encourage you to visit the Quilting Bee Blocks group on Flickr. Erin does a fantastic job of corraling the news from the many bees happening on Flickr, including new bees that are always opening up and recruiting new members. Consider this an apology to my poor, neglected blog for being MIA the past few weeks. Work's been crazy, home's been crazy, Halloween, yada yada yada ... you've heard it all before, so I'll spare you the details. But the good news is that I have 3 blog posts already in draft mode and a few more in my head, so as long as I can eke out a few minutes each day to finish them up, then you'll be negelected no more, dear blog. 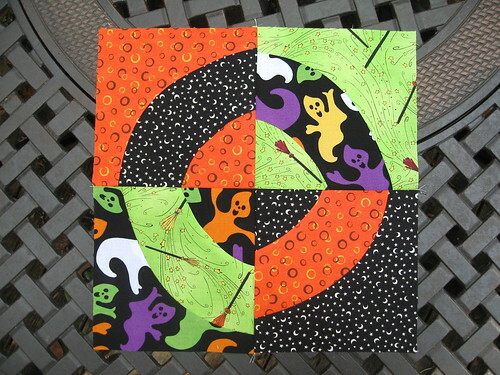 First thing to catch up on is my September (yes, I know it's already November 5th) Year of Schnibbles quilt. I'm sure you've heard of the Year of Schnibbles by now. 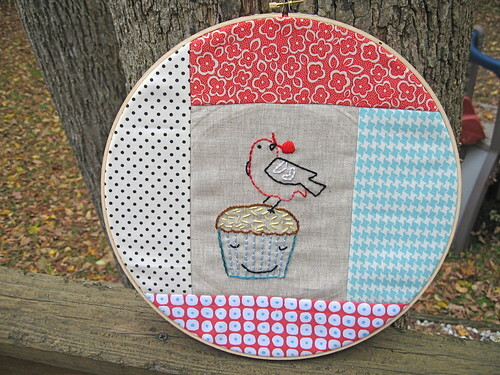 The brainchild of Sinta and Sherry, A Year of Schnibbles is a challenge (maybe more of an invitation) to complete one of Carrie Nelson's Schnibbles patterns each month for the next 12 months. I've always admired those patterns but never made one, so I was excited to jump in. 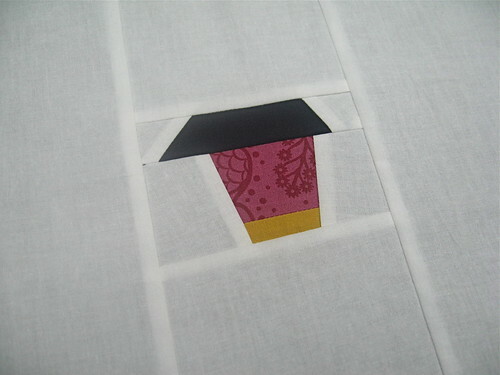 The first pattern for the month of September was called Winter White. It seemed like a great pattern, and I immediately knew that I was going to dip into my stash of Tula Pink's Nest line to make mine. I scrambled to get it done in time (nothing like a deadline to keep you motivated) so that it could be included in Sinta & Sherri's monthly Parade of Schnibbles for September. 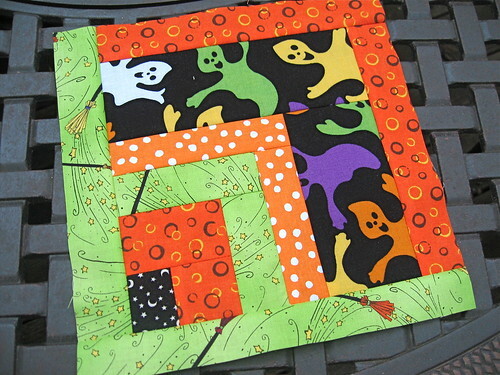 As you can see, I didn't get it quilted and bound in time -- and it still isn't -- but I'm going to try to tackle it soon because I really like how this one came out! Unfortunately, I didn't get to play along in October (when Cindy Lou Who was the selected pattern), and it's not looking good for November (Picnic) either. That's OK, though -- I don't need to make every one. I think I'll dip in and out based on the selected pattern and how the month's shaping up. 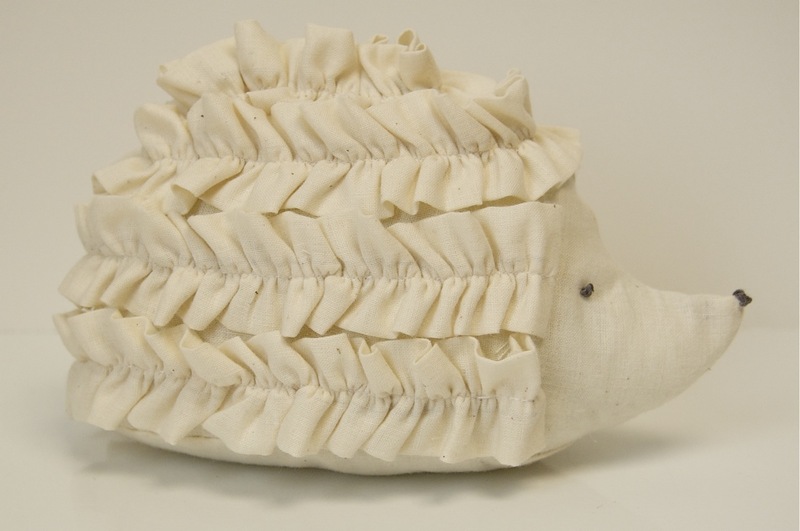 There are quite a few Schnibbles patterns that I'm excited to make and hope will be in the rotation. Oh, and did I mention there are prizes and giveaways involved? If you're not already participating in the Year of Schnibbles project, I encourage you to check it out. It's great fun. Finally, to my dear readers: I miss you guys! How are you doing? What's new? What'cha working on? Anyone else (besides me) both looking forward to -- and stressing out -- about the holidays already?